Family-friendly properties with private boat slips on the Intracoastal Waterway. Whether you are a nature lover, a water sports enthusiast, or a golfer married to a sun-worshipper, Porter’s Neck Plantation, Landfall, Ocean Isle, Sunset Beach, Wrightsville Beach, Figure Eight Island, Pleasure Island, Carolina Beach, Kure Beach, and many other communities in and around Wilmington may be the right choice for your new home. Stand-alone homes, beach houses, condos, patio homes and waterfront communities make up idyllic neighborhoods and townships where year-round residents, part-time residents and investors create a perfect blend. With any home purchase, it's important to figure out exactly what you want and need from you home in order to make a wise decision. But with a highly desirable NC waterfront home for sale, you don’t want to make a wise decision, you want to make the right decision. Special considerations should be taken to ensure that your property will suit your lifestyle and allow you to enjoy the activities you love. Beachfront Homes are located adjacent to the sand or dunes of the Atlantic Ocean. With a beachfront home, you can just walk out your door and onto the beach. Such close proximity to the ocean is ideal for early morning walks on the beach or a quick dip in the ocean. When not taking advantage of the beach, beachfront home owners can still enjoy the ocean breeze and the sound of the ocean while staying protected from the elements. Ocean View Homes are second, third and fourth row homes not situated directly on the beach, but still close enough to the ocean that residents can enjoy easy beach access with just a short walk. In an ocean view home, residents can still smell the salt in the air, but they don’t have to get sand on their feet unless they want to! Intracoastal View Homes are located on the interior land of the barrier islands. Depending on where they are situated, these luxurious homes provide your own private view of the waterway and the sunrise, or the sunset. Intracoastal Waterway Homes are flush to the seawall of the Intracoastal Waterway. These homes usually have private boat slips for easy access to the water. They are an ideal choice for boaters, kayakers, and water sports enthusiasts. Riverfront Homes are situated adjacent to the Cape Fear River which winds for more than 200 miles throughout the region. Consequently, there is a diverse offering of riverfront homes from the hundred-year-old historic mansions in downtown Wilmington to newly developed riverfront communities that continue to flourish due to the area’s significant growth over the past decade. Sound Front Homes back up to the saw grass that defines the borders of the sound communities of Coastal Carolina. These scenic homes are usually nestled amongst large live oaks dripping with Spanish moss. Homeowners can enjoy the gentle hum of natural wildlife and the soothing whisper of weaving saw grass. Sound View Homes offer views of lush marshes and winding waterways along the sound. These homes are perfectly suited for wildlife viewing, providing a soothing environment away from the hustle and bustle of the city. How do I envision using my waterfront property? What are your priorities when it comes to a waterfront lifestyle? Do you want to be able to grab a surfboard in the garage and walk right out onto the beach? Do you need a boat slip? Which is more important, water access or an unforgettable view? What types of recreation do you enjoy and can you easily enjoy them in this home? Do you want a quiet place on the sound for kayaking and enjoying nature, or a busy spot on the Intracoastal for jet skiing and big parties? How often will I be there? Some properties are better suited for seasonal use than others. Buyers looking for a seasonal property typically prefer oceanfront homes whereas year-round residents are more likely to choose intracoastal or ocean view homes. Also consider how often you will have guests; nothing is more enticing to friends and families than visiting you in a beautiful waterfront property! We’ve all heard the old adage that in real estate, there are only three things that matter: location, location, location. When searching for the ideal waterfront property, make sure that you think about location in terms beyond the proximity to the water. Ask yourself: Is the property in close proximity to the amenities that matter most to me? Consider whether you’d rather be closer to the shops or the golf course. How far away is the nearest marina or yacht club? If you have medical needs, be sure your property is convenient to a hospital. If you travel often on business, limit your search to properties within reasonable driving distance to an airport like Wilmington International Airport. What Is It Like to Live in a Waterfront Home? 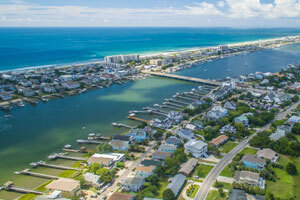 The allure of waterfront living has made Southeastern North Carolina one of the most desirable places to live in the United States, but what is it really like to own a waterfront property in the area? Intracoastal Realty has assisted countless homeowners find their dream homes by the ocean, the Intracoastal Waterway, the Cape Fear River, and Masonboro Sound. What Is It Like to Live in Southeastern North Carolina? One of the first adjectives people use when describing the Wilmington, NC area is “charm”. The air is tinged with the fragrance of the ocean, the beaches are clean, and the people are welcoming and friendly. Wilmington’s walk-able historic downtown is the heart of the artistic community with film festivals, art galleries, and local theater productions. The Riverwalk is a gathering place where you’ll find the local farmer’s market, free concerts, and seasonal festivals. You’ll find plenty of great places to shop, eat and explore throughout the area. Points of interest include the USS North Carolina Battleship, Greenfield Lake, the Fort Fisher Aquarium and Cameron Art Museum. If you feel the need to splurge, you can head over to The Forum, Mayfaire Town Center or Lumina Station. Another great feature of living in the area is proximity to historic Southport, Bald Head Island, Wrightsville Beach and Carolina Beach. The area draws a wide range of residents, giving real character to the community. You’ll find families who enjoy the excellent private schools and the active churches and religious groups. There are professionals who love the proximity to major highways and airports, yet enjoy relaxing on the beach during weekends. And, you’ll meet quite a few empty-nesters who have claimed the area as their new home due to the temperate climate and the dynamic array of leisure activities. Most residents say they live in Southeastern North Carolina because it’s where you can truly “find it all”: city living with small town where beautiful waters and quality amenities are always close by. Find the perfect NC waterfront home for sale.